This awesome time-lapse video showcases the rise of the Amity, Oregon winery's new tasting room and production facility. Brooks Winery is opening their brand new tasting room and winery in Amity, Oregon just in time for harvest—and the release of Portland Monthly's 50 Best Oregon Wines list, featuring not one but two Brooks pinots, on newsstands now. “We broke ground on April 1st and in record time our new winery was complete, ready to handle the 2014 harvest and welcome visitors,” says Managing Director Janie Brooks Heuck. 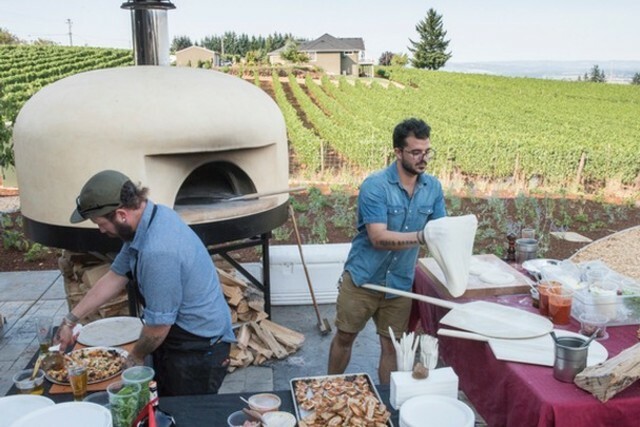 Rising to the challenge of meeting harvest deadline, Portland architect Richard Brown and Perlo Construction oversaw the entire process along with Pihl Excavation, Cascadian Landscaping, Basile’s Workshop, Pioneer Millworks, Oregon Barrel Works and Clay Wesson. Check out the build-out of the new space above! At the new winemaking facility and tasting room, wine enthusiasts will enjoy a view of four mountain peaks, wide open deck spaces, and a clean design utilizing rustic wood and repurposed barrels. The space has a wood-burning pizza oven and direct access to an herb garden, and in addition to Brooks wines, local craft beers on tap and espressos are available. Want to see it for yourself? Head out to 21101 SE Cherry Blossom Lane in Amity, 45 miles southwest of Portland. The tasting room is open from 11 am-5 pm, Tuesday through Sunday. The space's official Grand Opening will take place Saturday, September 27 from 11 am-5 pm when guests will be able to enjoy the tasting room's new food, beer, and wine offerings from Brooks and some special guests.